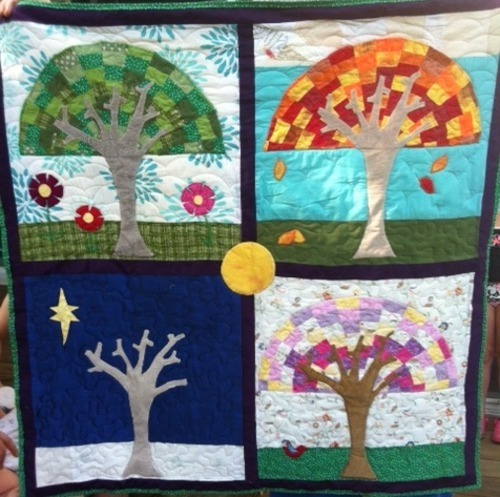 I made this quilt for my niece to celebrate her adoption. I picked the seasons theme because it took many of them for her adoption to finally go through – more than 3 years, actually. Her tree canopies have 10 wedges. Mine have 13, because I didn’t have an 18-degree ruler and decided to wing the angle measurements. She has a complicated border. I ran out of time, so I do not. My tree branches are more angular; hers are more curvy. Summer panel: I made my own flower design because the one from Fielke’s quilt didn’t really work with the fabrics I had. Fall panel: I added a strip of randomly sized white and off-white pieces to represent clouds at the top. No one who’s seen the quilt in person recognized them as clouds, though. Oops! Winter panel: Daylight only lasts 9-10 hours in winter where I live, so I made the winter panel a nighttime scene. I also added a big ol’ Christmas star since her dad’s a big ‘ol Christian pastor. Spring panel: In the original design, the spring tree has only 6 evenly spaced wedges. The spaces between the wedges represent the lack of leaves on the three. But I didn’t like that look very much, and it would require more appliqueing, so I did a 13-wedge canopy, interspersing some of the background fabric among the “leaves” to give it the sparser look. I think I may actually prefer the back of this quilt, but I don’t have a picture of it handy, so that will have to go up later. I did all the piecing, but I hired a friend of a friend to do the machine quilting. My machine is tiny and it’s hard to cram a blanket this size (about 4 foot square) in there. Friend of friend has a long-arm quilting machine; I had money. I gave her the money and she saved me hours of frustration.